stock here: For radiation in Propane I haven't run it to ground, so to speak, but quickly theorized that fracking for natty creates much more released radiation in the gas. I have for a long time been hearing that fracking increases radiation release and that the even frack with hundreds of chemicals, some radioactive also, mostly to get rid of them. ACTIONABLE ITEM: After mostly vetting the issue, and it is one, there is some legitimate concern. 1) House heaters and water heaters will vent to the outside, the radiation will be released there, at the vent. Probably you will have limited contact with your release, but people are releasing all over the place. 2) Gas Ovens / Ranges -- These are "direct vent" right into your living space, so the products of combustion and radiation will be released into your living space. Simple mitigation -- always run the exhaust fan when burning the Oven / Range. This is so darn hard to do, but here goes. Talk about finding radiation. We recently made a shocking discovery that was reported to ENE here to post as a story about a month ago, but Admin did not post it. Do the homework people and use your tools to verify and report your own results. This is a worthy story that deserves its own thread. It was a horrible and shocking discovery to make this warm sunny Tuesday that started out as another beautiful fall Indian Summer Day. Little could anyone know that today would reveal a secret that no one could have ever had any concept of, except the evil that causes it. Some history: long has there been a big proven suspicion that propane being burned indoors IS RADIOACTIVE. Higher radiation than the normal background amounts in this area of So. Colorado, and northern New Mexico. Yes, that’s right. EVERYONE that is using propane in the four corners region, perhaps the country, or even the world, is sucking in forced radioactive heated air from the burned propane. Most likely Natural gas too. This is also why so many heart attacks happen during the winters. Counts upwards in the 70-80’s CPM(100 CPM is alert level) have been measured indoors during past winters by placing the counter in front of the blowing air from a propane heater. We do not use Natural gas, so that still needs to be checked. Our families have stopped using that forced air propane heater, and will always use a small wood stove after finding this information to be true. It has done the job of getting through a few good winters so far. Anyone can easily check this out with a good counter. Not a cheap one like many people get. The cheap counters do not count as much as a mid-range or high dollar one will. There was a time when we checked the small propane tank we have for BBQing and it was found to be hot(radioactive) too. We wondered about the source and found that areas north and south had been nuked to get it to come out of the ground. Why else would they frak gas using nukes to do it? More so, why do they sell this poisonous substance to people to heat with? So when the propane truck showed up for the regular winter filing just recently, here was the chance to check it out. A big source of the propane. Not the original source, but a carrier itself to see how hot(radioactive) it might be. On prior occasions the driver was told that there was the possibility that the propane he was carrying was radioactive. He did not believe it then, so this was the opportunity to prove, or not prove the suspicion was true. It was decided to place the counter on the nozzle on the side of the truck. The good man offered to open up the relief valve and was immediately told, no thanks, this will do. Rads would go through the metal. In the setting of the counter on a spot atop of the nozzle on the side of the truck where it would count and not fall off, the audio sound was on and it was already ticking very rapidly. No doubt this was going to be a high reading, but how high? It would take ten minutes to do the quick counting to find out. We waited and talked some more and then the timer went off. Beep beep…beep beep…beep beep…it was the sound signaling the end of a ten minute count. We could already tell it was going to be high, but had no idea how high. The count registered 1671 total counts in ten minutes, for a count of 167 CPM. We were shocked! Simply waylaid to see how high this reading was just sitting atop the nozzle. Did not even want to imagine what the count would have been if the propane gas was openly exposed to the counter. 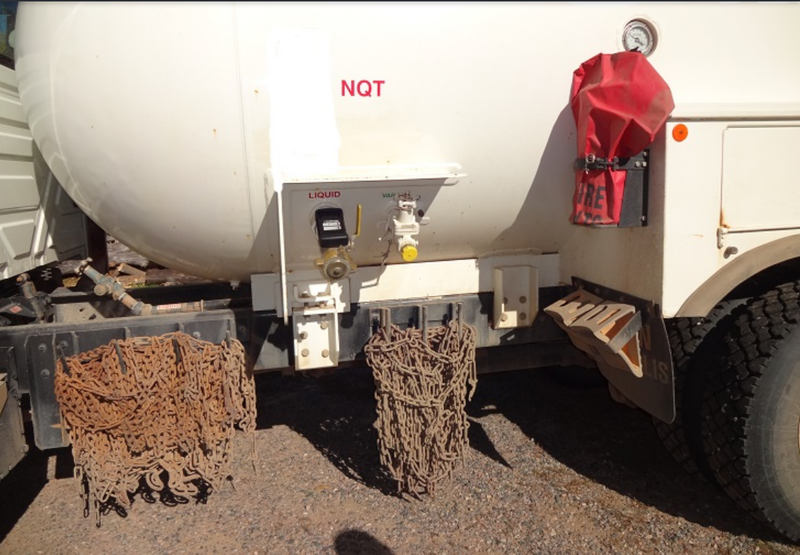 Then, for further evidence of what we found, the hand held counter was placed up close against the outside of the truck almost touching the large tank itself to check what the reading would be in uSv/hr. It actually went higher before this picture below was taken when it was at .772 uSv/hr. The poor guy was shocked. That made two of us. Totally shocked to find out this horrible truth. Told him to mumms the word, not to tell his boss, and to talk to his wife about how important this job really was, considering it was killing him at a faster rate than anyone could even have imagined. 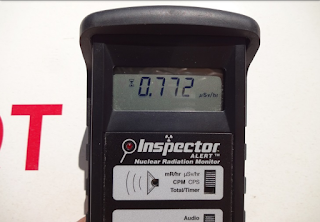 This added to the abnormally high background radiation of the area, Fuckushima, Hanford, and all the other leaking nuke plant fallout coming from west of the Rockies, makes this one heck of a dangerous occupation, much less how harmful it is for the average person who is using Propane or Natural gas heating indoors. The very word ghastly, comes to mind. Someone mentioned the ashes of the wood and a measurement from that some time back revealed that yes, it too is hot. Not as bad as the propane truck or forced air heating though. The ashes are more or less contained then disposed of into a burn pile for more recycling. Remember, radiation only adds up in the body. It never goes away. 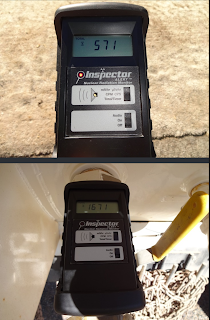 Here below are the pictures that were taken on 10-10-17 of the propane truck and counter in action. What a day to remember. For any who doubt how dangerous this is, you are invited to get your own higher-end Geiger counter(Inspector Alert) and check this yourself. If you do your homework and learn about slow radiation poisoning, the causes and effects, you will not be happy to find out what you will uncover. The sad part of this story is, no one will care or do anything to stop it. Big babylonian oil oligarchs will not stop robbing and killing the people. When it comes right down to it, the really extremely horrid part of this is the fact that people are actually paying the propane suppliers to kill them slowly. Paying big money to kill themselves off. Is that sane? This is a sad report to make, but perhaps this information can help save some lives. 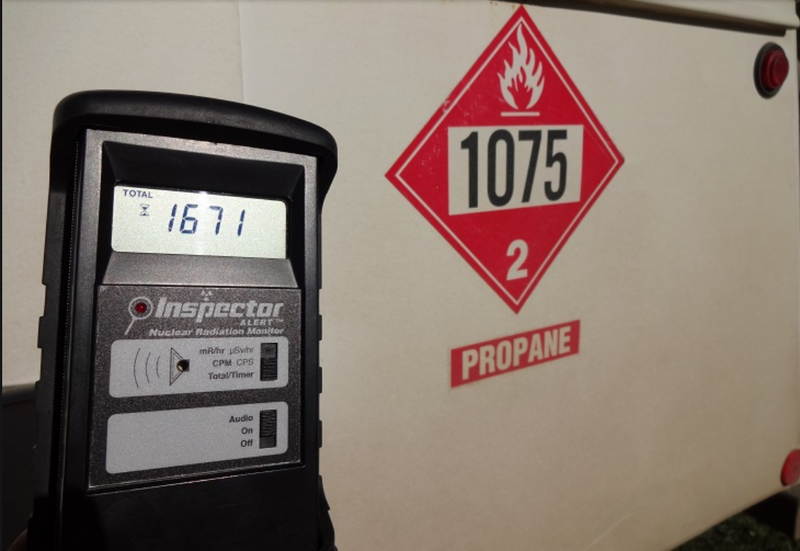 Some folks are going to walk away from this article thinking well, I don't use propane for heating and yes the natural gas needs to be checked. But what I'm getting at here is farmers must dry the corn after harvest and with that they use propane to heat the dryer. Some large farms use 3, 1000 gal. tanks to store propane to fire the dryers. Guess we have to check the corn we eat and feed for livestock. Ya, that drying is probably direct fire, so a risk. This was on my mind while cooking supper listening to the gas flame hissing, bentonite clay cartridge inline on the gas feed. A couple of problems here the disposal of hazardous waste which we haven't figured out yet. Plus you would need a hazmat suit to change cartridges! Just an idea, there isn't one. ya might need to be standard operating procedure to run the exhaust hood when using the oven. That's a good idea and that's easy. This is going to evolve as we move into Toxicology Engineering. I love it, maybe the title of my next website, if I can steal it>??? It's yours, do it, we can all chime in with ideas. Don't worry about patents (been there) just make it where no one can compete with engineering coast and final product. I'm working on 'Trailer Park Engineering' because a lot of us are short on cash. Where R&D comes from scrap metal, scrap wood an old Folgers can filled with nuts, bolts, screws, spacers, washers and it gets built. Example flywheel puller for an English Jaguar (friend of mine) $300.00, we manufactured one for $20.00. TPE saves the day. Yup, farm boy type stuff gets stuff done, cause there ain't no use else to do it.